Overwhelmed by too many Digital pictures ? 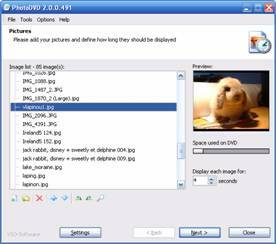 This week VSO Software is releasing a new version of its DVD slideshow generator : PhotoDVD 2.0. Hot new features include DVD subtitles for adding comments, multiple audio tracks per slideshow to fit the mood of various audiences, and focus points to each picture. 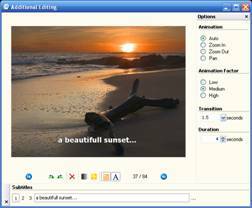 VSO PhotoDVD takes your digital pictures and animates them to create a compatible DVD movie. This software is one of the simplest of its kind on the market with all the animation factors taken care of for you. T he engine responsible for this analyzes the picture’s size and orientation to automatically create a movie with cool fade, zoom, and pan effects. So, if you never know what to do with all those digital pictures stored on your hard drive and tired of printing costly pictures, find out what PhotoDVD can do for you. With a couple of clicks to select pictures to add and soundtracks to play, and voila! . . . an animated DVD slideshow with personalized soundtracks of your music and subtitles to accompany your pictures! Now you have a safe back up and an easy, fast, and especially nice way to share your pictures with friends and family. The result is attractive and vibrant! The product is very easy to use and it is compatible with any DVD writer or players. With PhotoDVD there are multiple ways you can edit your pictures including their rotation, whether they be in color or black&white, and order them any way you want. You can take control of the automated animation yourself by manipulating zoom and panning motions, transition speeds between pictures, the duration of each on screen, and the overall animation speed. Use the new features by adding up to three audio tracks per slideshow as well as subtitles to your pictures. “The ability to select a focus point for each picture personalizes my slideshow by highlighting details of my pictures. This adds a touch of sophistication to the final outcome that I never thought was possible yet remaining very easy to use.” , According a beta tester commenting a new feature. Once your slideshow is burned, you can watch the results on a regular TV or computer using a DVD Player. This format uses the best quality available. A copy of your source files is stored in the DVD project and lets you keep track of your digital pictures without quality loss using a computer. The new project management feature let you burn again without the need to encode again. Satisfied with your trial period? PhotoDVD can be purchased online for €19.99 (approx $24.99 USD). Payments accepted for purchase are: Visa/MasterCard, Paypal, check or wire transfer and in retail in some countries. VSO Software an innovative company located in the south of France (Toulouse). During the last few years, VSO has become popular for their excellent burning engine! VSO Software is dedicated to producing very easy to use software with user friendly interfaces and promissing quality output. Among the most used VSO products, BlindWrite, CopyToDVD, and the latest on the market DivxToDVD (also available in the latest Roxio suite) are continuously updated and improved. VSO-Software also provides burning engine SDK to be integrated by others companies and customized programming service. Press and webmasters are allowed to publish in their website and cover CD the trial version available at www.vso-software.fr. Special discount coupons can be created on request.